Pete Box of Analytics: Social Media training - How to do Social Media right? Social Media training - How to do Social Media right? Couple weeks ago I did a social media training with a small group of people coming from different organizations. This kind of social training, or should I say workshop, can be insightful and lots of fun. If you have been listening presentations in seminars and conferences, but still don't know where to start, this hands-on training is perfect for you. Before you create a Facebook page and start publishing just something about your company, you should educate your executives and the whole staff. If you're saying that our company doesn't exist in social media - think twice! People are probably talking about your organization and products & services related to your business, already in social media. Start using Google Alerts, Whitevector, Radian6, Statsit or whatever tool to listen what people are talking in world wide web. Now, don't get mad if you are not getting the feedback you would like. Remember, this is a chance to develop your company. Be careful: gather data from different sources and analyze your whole web presence! One very simple tip: put share buttons to your website with AddThis.com and integrate the analytics part with Google Analytics. Analyzing part is the most important one in order to improve your (online) business. If you don't have time or knowledge to do that...well, that's our business and we are glad to help. You can contact me through these channels any time. Analysis is the ground where you start planning. When you start planning how to use social media, bring (marketing) communications of your organization on the table. Someone in your company must know what is the public information you are publishing to the world - when you are doing it and who's doing it. What kind of public information you may already own? How you can get more material from your community? That's your company people, customers, partners, friends etc. In this point you should know what are the possible social media platforms / services or channels, like I use to say. 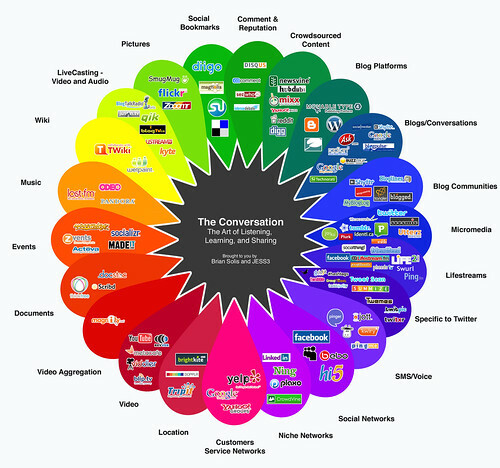 This conversation prism by Brian Solis is super to get the whole picture of social media channels. Then comes the hardest part. When you plan something, whether it's a campaign, your website or social media, start with the purpose and goals. What are we trying to gain and why? There are plenty of chances how you can engage with people and benefit from it. You can recruit, you can do product & service development and first of all: you can help people (to buy). Know your point and then it's quite easy to define the right key performance indicators. Macro goals can be e.g. number of applicants to certain position or number of new ideas. Micro goals are e.g. number of people who liked or shared the new position or number of new conversations or posts in services forum. Now you should have an idea how to measure social media right and that is, against your goals / purpose. When you do the previous task you should be able to tell who are the people in your organization which should especially be involved in social media. But beware: in order to get full benefit, get as much people involved as you can. And remember: benefits won't come over night - you should have a long and consistent plan to do things over a timeline (a year perhaps). You know how to monitor and measure social media, you know what material you will publish and you have a plan and people to do that. (this is called management). Go on and execute that plan! : ) I know, I know...it's not that easy and there may be some holes in your way. But hey, this is what the leadership is. Don't work alone! Start training executives and leading top down - I'm sure it will pay you back. If you liked this post, please do me a favor and share this to your colleague or your boss. Like always, feel free to comment. Be social and write down your thoughts. If you want to attend to this social media training, you can get a discount code from me.